Ian signed for Partick Thistle from Coltness United in 1974, and went on to be an important player for Thistle, eventually becoming the youngest ever captain for the Premier Division side. After over 100 appearances, he signed for United in October 1980 under freedom of contract. There was a dispute between the clubs over the fee, which was later set at £75,000 by a tribunal. He made his debut two days later against Kilmarnock, but as he was a late signing, he was illegible for European and League Cup matches. In the League he was originally given a good run in the starting eleven, but by the end of the season he was mostly used in the reserves. 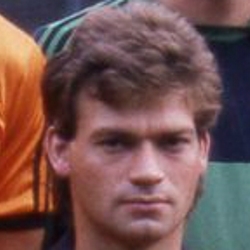 Ian never became an established first team player, and was seen mostly on the substitutes bench for most of the 1981/82 season. He was an unused substitute for most of United's European games as the club reached the quarter finals of the UEFA Cup, and this trend continued into the 1982/83 season. Midway through that Championship winning campaign he moved to Morton on loan with John McNeil coming to Tannadice. He then went on loan to St Johnstone, helping the Muirton side gain promotion to the Premier Division at the end of that season. During the summer the deal was made permanent for a fee of around £15,000. A regular during his four years in Perth, he became their player/manager in 1985. In 1987 he moved on to Raith Rovers for two years, and then took up the position of player/manager at Arbroath before retiring in 1991. Ian was born on this date in Hamilton. It took a long time in coming, but after ten league games, United finally registered their first league win of the season. Having said that it looked, in the first half at least, that the strain of trying to register that opening victory was telling. New signing Ian Gibson was handed his debut, with Iain Phillip dropping out after last weeks draw with Partick Thistle. Jim McLean made one change to his starting line-up from the side which had been unlucky only to pick up a point at Pittodrie midweek with the Dons snatching a less than deserved equaliser from the penalty spot late on in the game. Midfielder Billy Kirkwood was brought into the team – replacing John Holt who dropped out of the squad altogether. With Kilmarnock rooted at the foot of the Premier Division table and United sitting in fourth McLean would have been hoping for – and probably expecting – a big win prior to kick-off, and that’s exactly what he got. After St Mirren's defeat to Aberdeen in midweek, United just needed a point in their final league game of the season at Firhill to clinch fourth place and the UEFA Cup qualification that came with it. Thistle on the other hand, needed a victory and goal difference to swing in their favour to avoid relegation. Former Thistle midfielder Ian Gibson came in for John Holt, the only change from the team that defeated Celtic.